"Some people see the Israeli pullout from Gaza last summer as the turning point in all this, because the local economy collapsed and left Palestinians feeling as if no one was in charge. The expectations were that life would get better. Well, it got worse. It became completely lawless and the jobs disintegrated as well. You needed someone to spearhead the pledging of assistance and the delivery of assistance. The U.S. could have done that. But we didn't have a point person." • Hamas's victory was in part a reaction against the corruption brought to the territories by Arafat and the Palestinian Authority. The Clinton Administration, with Ross as point man, never forcefully pushed for Palestinian reform and an end to corruption. It essentially supported Israeli policies that contributed to PA malfeasance - such as Israel's depositing tax receipts due the Palestinians under Oslo directly to Arafat's personal accounts, some 2 billion dollars, rather than to any accountable recipient. In addition, when Israel occasionally balked at the transfers in the wake of terrorist attacks, the U.S. Administration, with its point man Ross, pressed for their resumption. 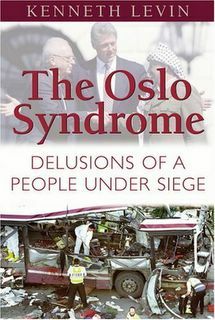 • The Administration, with Ross as point man, never aggressively pushed for a sustained PA crackdown on Hamas terror or for the PA's dismantling of Hamas's terror infrastructure, as required by Oslo. It never, for example, made such steps a requirement for continued American aid. • The PA promoted, in its media, mosques and schools, hatred of Israel and the message that Jews have no legitimate claim to any part of the land between the Jordan and the Mediterranean and their state should be destroyed. Arafat and his confederates routinely praised those who carried out terrorist acts, including Hamas's "martyrs," and urged Palestinian youth to emulate them. The Clinton Administration, with Ross as point man, never seriously pushed for an end to PA incitement, as called for in Oslo. As with its weakness regarding terror, it never made the cessation of incitement a condition for additional American aid. • In 1996, in the wake of an unprecedented wave of anti-Israel terror following Arafat's arrival in the territories, Israel elected Benjamin Netanyahu prime minister. Netanyahu insisted there would be no further Israeli concessions until Arafat and the PA lived up to those earlier Oslo agreements obliging them to halt terror, dismantle the infrastructures of Hamas and Islamic Jihad, and end incitement in PA media, mosques and schools. The U.S. Administration, with Ross as point man, rather than supporting Netanyahu, instead consistently pressured Israel to undertake additional concessions despite the Palestinians' failure to change their pattern of noncompliance with the anti-terror and anti-incitement clauses of the Oslo accords. Given that record, as we consider Hamas's election victory, we can also be confident that things would be still worse had President Bush emulated his predecessor in utilizing the services of a point person such as Dennis Ross. Even in an editorial ostensibly critical of Hamas ("Hamas at the Helm," February 2), The New York Times seems equally interested in once more whitewashing the Palestinian Authority. According to the Times, Palestinian president Mahmoud Abbas has failed to rein in Palestinian terror in part "because his ruling Fatah Party has been unable to tell Hamas what to do." But Fatah’s own Al Aksa Martyrs Brigades have been a major source of terror, which suggests there is more to Abbas’s failure than simply the recalcitrance of Hamas. However, the Times editors are silent on the activities of Fatah-linked militias. In the same vein, the editorial concludes: "No ruling government should strap bomb belts to its young people and send them onto buses and into restaurants to kill others." But of course Yasir Arafat and his Palestinian Authority were doing exactly that incessantly from the time they launched their terror war against Israel in September 2000, and the Times consistently chose not to chastise the Palestinian leadership as much as to harangue Israel for its balking at continuing negotiations with Arafat and for responding – in the editors’ assessment – too harshly to Palestinian terror. Echoes of that chiding also appear in the February 2 editorial, with a reference to Israel’s having supposedly "laid waste to Nablus and other Palestinian cities after the intifada began in 2000." Yes, Israel sent its military into Nablus and other cities to uproot terrorist bases and demolish structures in which bombs were built and bombers trained. Its main incursion came in the wake of the Passover massacre in Netanya in March 2002 that killed 30, and in Nablus alone the IDF found and destroyed more than 20 bomb factories. But to describe Israeli operations as having "laid waste" to Palestinian cities is a characterization as divorced from reality as the notorious claims of a "Jenin massacre" that never happened. The Times editors also criticize Israel for initially refusing to hand over millions in tax and customs receipts to the Palestinians; the editors insist that contributing to the coffers of a government that will soon be led by people openly dedicated to Israel’s destruction should be of less concern to the Jewish state than irritating its adversaries and thereby "pouring gas over an inflamed situation." The Times also suggests that the Quartet should not cut off aid to the Palestinians as that would "undoubtedly serve to push the Palestinians further into the arms of Iran." Apparently, Israelis are to draw comfort that the bombs and missiles aimed at them are paid for in part by Israeli transfers of tax receipts or Quartet subsidies rather than by Iranian financing of Palestinian terror. The Times editors hint at another rationale for continued engagement and financing of the Palestinians; an expectation that having to govern could well oblige Hamas to moderate its terror. "It is one thing to send suicide bombers to kill innocent people in Tel Aviv cafes when you are a fringe, radical group. It is quite another thing to launch attacks at civilians when you control the government." It transpires, however, that Hamas doesn’t actually need to give up terror to satisfy the Times editors. "The problem is," they declare, "[Hamas] refuses to say the words." The New York Times has shown Hamas the way. If only it would moderate its statements in English, and limit to Arabic its calls for Israel’s destruction and its commitment to terror, if only it would emulate Arafat and Fatah and the Palestinian Authority in this way, the editors of The New York Times could declare Hamas, too, a fit partner for "peace" and once more focus its editorial barbs at Israel for failing to make the concessions that would serve to grasp the imagined Palestinian hand of peace extended to the Jewish state. The eagerness of some Western leaders to offer rationalizations for Hamas's victory in the Palestinian elections, to deal with the terrorist group, and to find "moderates" in its ranks even as Hamas reiterates its dedication to terror in the pursuit of Israel's destruction has reminded various observers of the "Oslo Syndrome." Diana West cites the syndrome in her excellent February 3 Washington Times column "'Honest' Hamas". There comes a point, sometimes, when logic is denied, reason is abandoned, and that vital connection to reality is severed. Once upon a time, we called this a nervous breakdown and prescribed a rest cure. Now, we call it a press conference and take notes.